When I saw your online profile, it was love at first sight. I’ve always been partial to your deep red skin tone and your long green locks. Your earthy fiber fills me and satisfies me like no other. But alas, I don’t think you and I are meant to be together. We tried to make it work, baby. We gave it twice as long in the heat of it all to get you to crispy, but it just didn’t work. And then when I switched things up, we got burned too quick. I just don’t think my heart can handle your fickle ways. You’re great, and I know you’ll find someone, maybe many others, who can love you the way you were meant to be loved. I’ll always remember you. P.S. Can we still be friends? It happens to the best of us. The recipe that looked perfect and obviously worked well for someone else, just doesn’t turn out they way you want it to. I saw this recipe on Jules’ Fuel and thought it looked perfect! I like beets, I like chips. Let’s make beet chips! My first batch baked for an hour and a half–the recipe says 40-50 minutes–and they still were soft. A couple little ones were starting to get crispy, but I lost patience and I was getting hungry. So I ate them (still delicious, mind you) and vowed to try again with my remaining 3 CSA beets. This time I used a mandolin to make sure the slices were thin enough. I upped the temperature of my oven by 15 degrees. I spread the slices out onto both of my cookie sheets this time. Here is where the difference was made. The first pan is the softie pan that I used the first time around. This pan is wonderful for cookies–they never burn! If you are a somewhat forgetful baker like me, this pan is your best friend because it gives you an extra five minutes before anything is ruined. It is insulated and that makes it magic. The second pan is the old one I inherited when I married my husband. It does the trick, but it isn’t magic like the fancy first one. 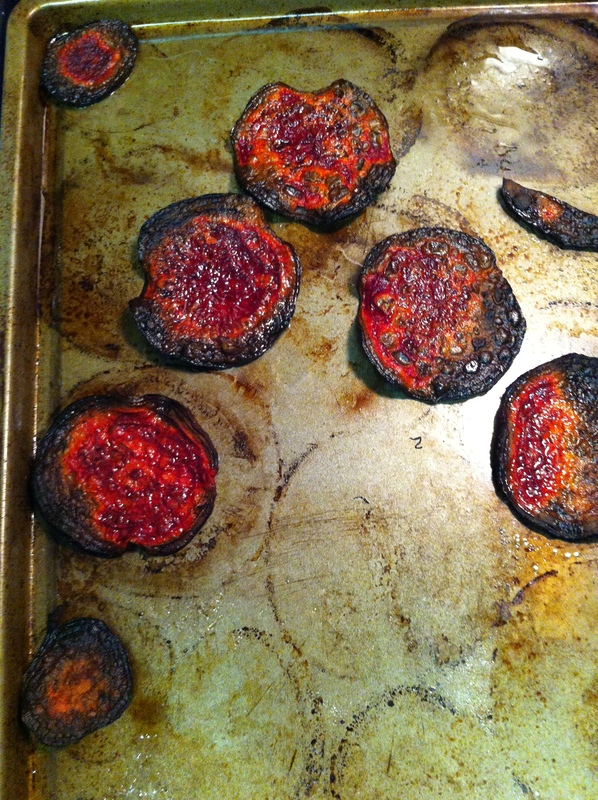 It will let anything burn, including my beet chips! This photo was taken after the completely black ones were put in the trash can so they wouldn’t set off the fire alarm again. The photo is of the “good” ones. When I pulled these out of the oven 30 minutes into the baking time, with smoke a-rollin’, the other pan was no where near crispy. So my husband suggested we move the remaining soft chips onto the burning pan and put them back in the oven. “I was just about to suggest that,” I said, and proceeded to do what I had already thought of (cough). After 10 more minutes, some of them were crispy, but I was scared they would burn again, so I turned the oven off and took them out. Did we end up with some beet chips to go with our salads that evening? Yes. Would I make them again? Not likely. Too much work for not enough payout for me. But perhaps I have some more talented readers who can show me up? If you plan to attempt, seriously check out Jules’ page, because her photos and story are far more inspiring than mine, obviously. 1. Preheat oven to 375°. Remove the greens from the beets (if not already done) and peel the skins from the beets. A vegetable peeler works great here. 2. Slice the beets into 1/4 ” slices. Arrange on a baking sheet and drizzle with olive oil. Sprinkle salt and pepper to taste on top. 3. 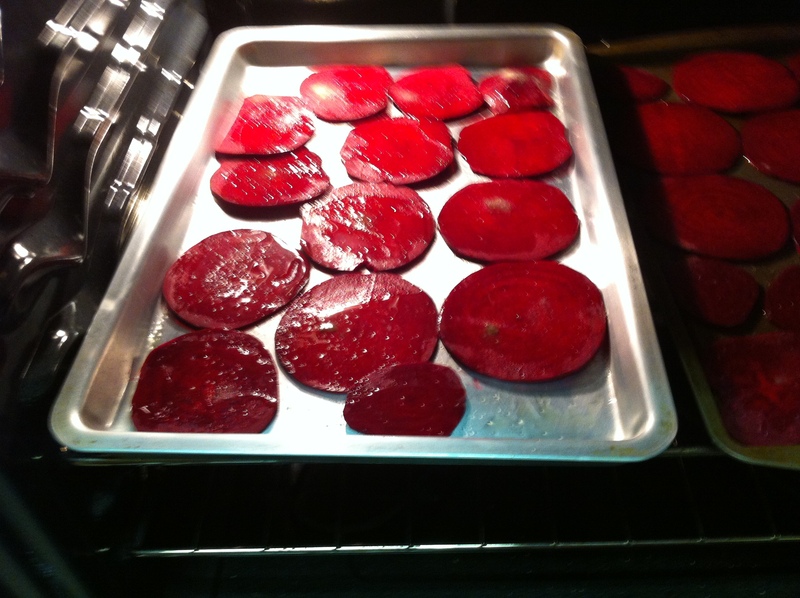 Bake for 40-50 minutes, or until beets are crispy and golden (if using lighter colored beets). Previous Post Previous post: Did we dodge a food fight? She made it look so easy and yummy. For me it was a disaster! But I tried. Come over and check out my Creamy Lentil Soup post that just went up! http://alittleclaireification.com/2012/11/17/30-days-of-thankfulness-day-16-creamy-lentil-soup-with-sausage/ That one is pretty fail-proof!